Get hyped, Guardians. We're only four weekend visits from Xur away from Destiny 2: Forsaken and a whole slew of new Exotic weapons and armor. Sadly, for now, all that tentacle-face has with him is some of his oldest wares. Let's take a look at what's on sale this weekend. 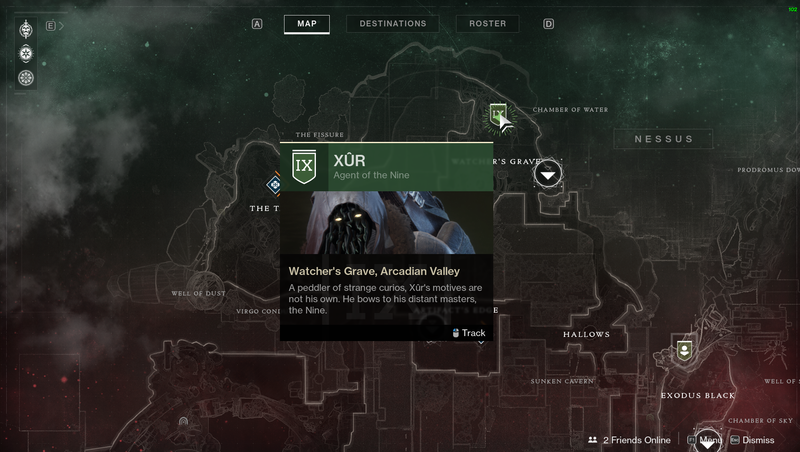 Xur is on this week's Flashpoint location of Nessus, in the Watcher's Grave section of the map. He's standing on the branch of a gargantuan tree. This week's weapon is Skyburner's Oath, a scout rifle that recently got some big changes made to it. It's a slug rifle that lobs explosive rounds when hip-firing, and it turns into a more traditional scout when aiming down the sights. It is also full-auto, does extra damage to Cabal, and penetrates Phalanx shields. It costs 29 Legendary Shards. 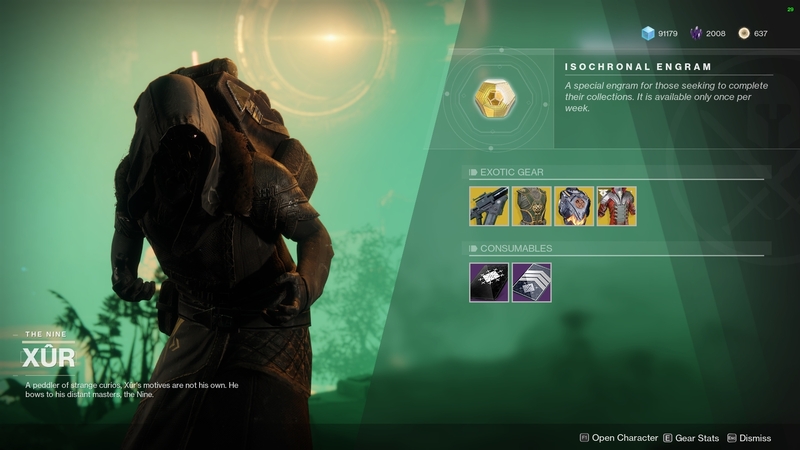 For armors, Xur has three chest pieces. Up first is The Dragon's Shadow for Hunters. Its Wraithmail Metal perk reloads all weapons and increases movement and weapon handling speeds for a brief time after dodging. It costs 23 Legendary Shards. For Titans, Xur has Hallowfire Heart. This chest armor greatly improves the recharge rate of your Solar abilities while Hammer of Sol is charged. It also makes it look like you're on fire. It costs 23 Legendary Shards. Finally, Warlocks have a chest piece from the recent Warmind expansion. Sanguine Alchemy has an awesome perk called Heightened Senses, which makes standing in a Rift grant you and your allies heightened senses, allowing you to retain your radar while aiming down sights. It also marks nearby enemies through walls, so it's really strong for usage in Crucible. It's on sale for just 23 Legendary Shards.